Each cell has its own cell .ts all. 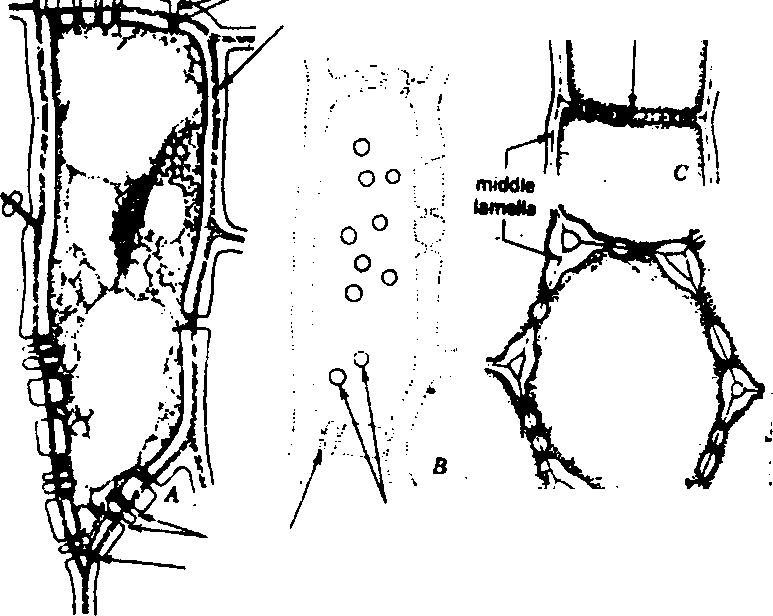 The cell wall of the adjacent cells is joined by middle lamella. Middle lamella is a thin layer. Cellulose is absent in it. It is mainly composed of pectic compounds. Middle lamella can be dissolved by applying certain chemicals. It separates the cells. This process is called maceration. Middle lamella acts as an intercellular substance. It holds the cell together. Primary wall is elastic and transparent. It is the first wall formed in the developing cell. It remians primary in many types of mature cells. It is present only in the living cells like meristems and other living tissues. But it is absent in non-living cells like tracheids, sclerenchyma etc. Primary wall undergoes extensive growth with the increase in size of cell. It is chiefly formed of cellulose and hemicelluloses and pectic material. 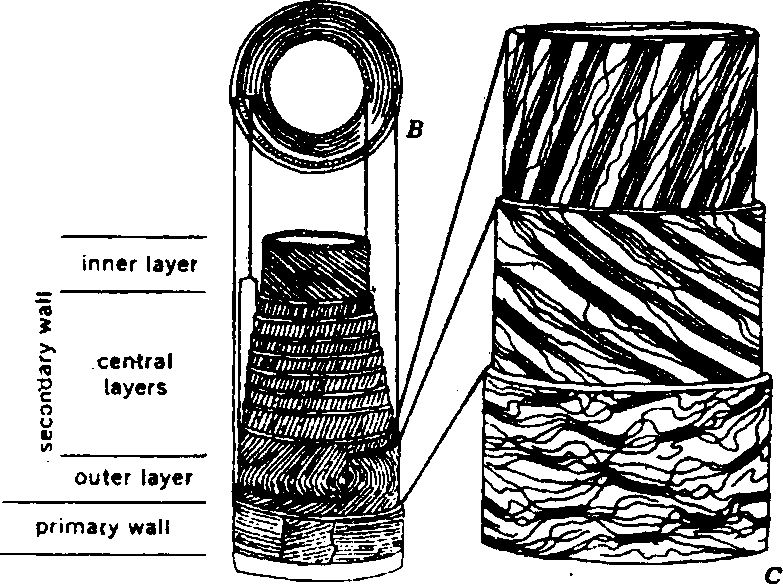 The increase of thickness of primary layer occurs due to deposition of successive layers of cellulose towards the inner side of the cell. Lignin is deposited between the primary wall and middle lamella in mature tissues. 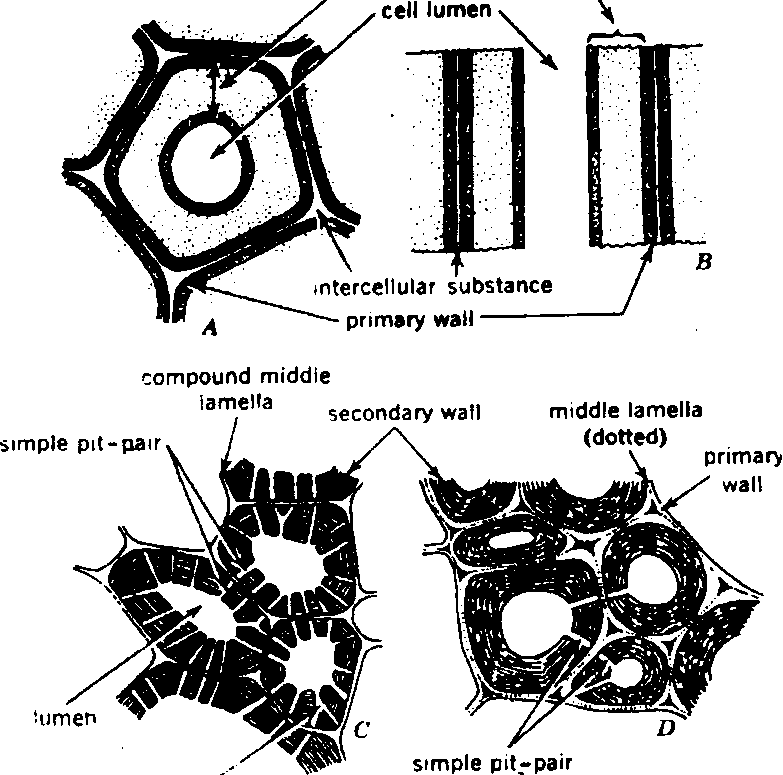 Therefore, primary wall cannot be differentiated from the middle lamella. The primary naIl or many cells has lamellae like structures called tnicrofibrils These microtibrils are arranged in eriss cross manner. The increase of surface area of primary wall stops with the stoppage of growth of cell, now secondary wall is formed inner to the primary wall. secondary wall has no surfacegrowth. I. Annular: These are ring like thickening. In this case, ring of lignin are deposited one above the other. Scalariform: These are ladder like lignin thickenings. Spiral: In this case, thickenings are arranged in spiral bands. Reticulate: In this case, lignin thickenings form networks. Pitted: The entire cell wall is thickened. It has only few tin-thickened areas called pits. cell wall is mainly composed of cellulose molecules. These cellulose molecules have special arrangements. 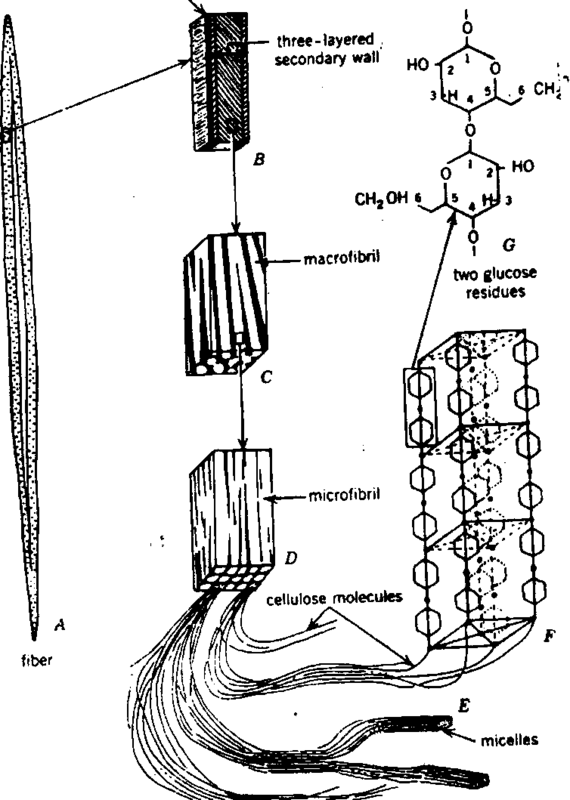 Micelles or Elementary microfibrils: The cellulose molecules are combined into many very fine bundles. These bundles are called micelles or elementary microlibrils. They are 100 ALI ill diameter. Micelles are crystalline aggregate of cellulose molecules. Micelles are individual units. According to Fre Wyssling. each micelle is composed of 40 cellulose molecules. Most of them are arranged in crystalline order. Only a small pan arrange randomly to form para-crystalline. Sometimes, micelles also contain small amount of chitin as in some algae. ‘Flie interlibrillar matrix contains pectic, compounds and , hemicelltdoses. The addition of these substances in cellulose libers is called incrustation. It increases the tensile strength of cell \Nall. Lignification also occurs in higher plants. Microfihrils: The elementary librils join to form bundles called They are about 250 A. Microlibrils are the basic unit cell wall The orientation of the microtibrils determines the nature of cell wall. These fibrils have circular. longitudinal. and oblique arrangements. These arrangements determine thetensile strength. plasticity and elasticity of the cell wall. Macrofibrils: The microfihrils combine together to form large sized bundles called Macrolibrils. 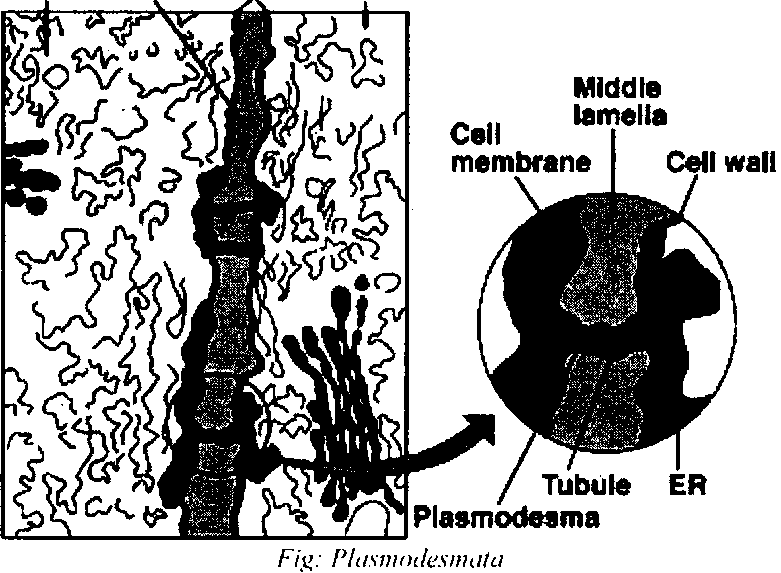 The plasmodesmata are cytoplasmic strands that extend through the pores in adjacent cell walls. The protoplasts of the adjoining cells are not completely separated by the cell walls. The protoplasts of adjoining cells are connected by fine strands. These strands pass through pores and form plasmodesmata. Plasmodesmata are concerned with the transport of material and stimuli from cell to cell. Cavities or thin areas within the thick secondary wall are called pits. Pits are left during process of secondary all formation. Such cavities or perforations are also found in the primary wall. These are called primary pit fields in primary %van. Plasmodesmata are formed through primary pit fields. The primary pit fields are turned into pits during the secondary all formation. But pits are also arised at places %% here there are no primar pit fields. The pits of the adjacent cells are complimentat,. i.e, pits of cell walls of two adjacent cells are in front of each other. The two opposite pits are separated by a thin layer of secondary wall. It is called pit membrane. The pair of opposite pits in the wall of adjacent cells is called pit pair. 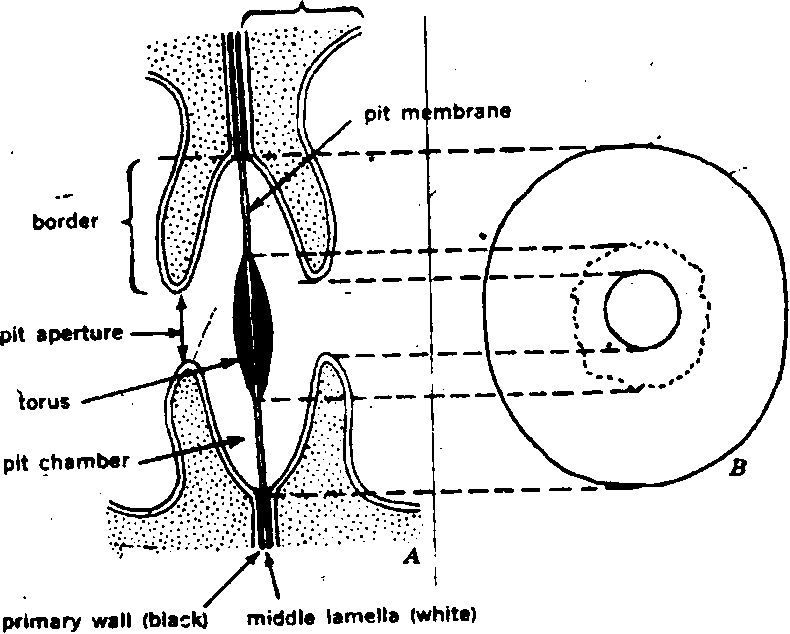 Material passes through this pit pair from one cell to other through pit membrane. There are following types of pits:. Simple pits: The diameter of the pit cavity remains uniform in simple pit. Pit cavity trpens in the lumen of the cell. Therefore, the pits of the two sides of the common wall form a simple pit. Bordered pits: In this case, secondary wall arches over the cavity of the pits. Thus the pit opening become narrow than the pit diameter. Bordered pits of the opposite cells form bordered pit pair. The cavity in the thick secondary wall is called pit chamber. 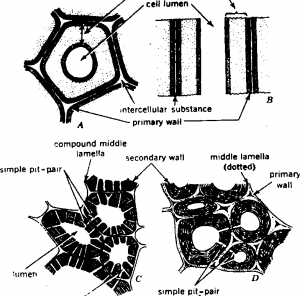 The bordered pit opens in the cell lumen by pit aperture. The pit aperture is circular and much narrower than ihe diameter of pit chamber. In certain cases, the pit apertures are lenticular or linear or mai. ‘the pi.t membrane of bordered pit develops an oval thickening in the middle. It is called torus. Pit membrane is flexible. The liquid in cell put pressure on torus membrane. Pit membrane pushes the torus. Thus the torus closes the bordered pit. It slums that torus control the passage of pit through bordered pit. Bordered pits are more complex than simple pits. These are found in the vessels. tracheids and fibers of xylem. Half bordered pit pair: In some cases, bordered pit has a complimentary simple pit. Such a pit pair is called half bordered pit pair. Blind pits: Some pits do not hate ally complimentary pit. Such pits are called blind pits. Compound pits: Sometimes, there is one pit on side. But there are two or more complimentary pits on opposite side. Such pits are called compound pits. Scalariform: In this case, pits are arranged in trans crse rows. Opposite: In this cases pits are one line and in pairs. Alternate: In this case. pits of two linear row s alternate w. ith each other. Crassulae: These are linear or crescent shaped thickenings of primal) all and middle lamellae. These are present between the bordered pits. These are \ ell des eloped in the tracheids. 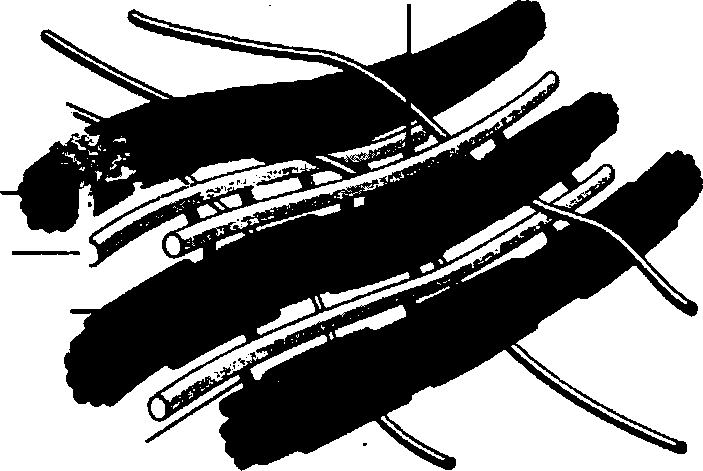 Trabeculae: These are rod shaped thickenings of sall. These are present in radial walls or \Hem eletucnts. Cystoliths: These are stalk like outgrowths of the wall. These projects into the cell lumen. Cs stoliths are composed of cellulose and calcium carbonate. These sometimes, completely fill the cell. Cystoliths are present in certain parent:lips:atolls cells and epidermis. Warts These are present on the inner surface of secondary all of conifer tracheids and sessels. 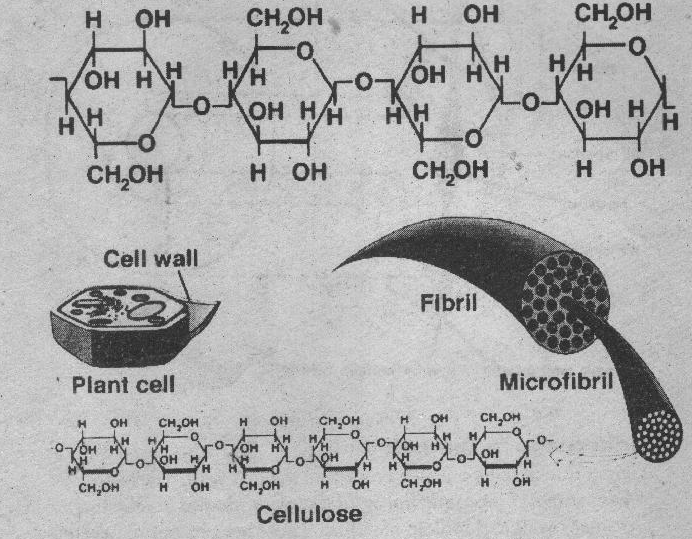 Cellulose: Plant cell wall is mostly composed of cellulose. Cellulose is a polysacchride. Its general formula is Cellulose is formed by the linear chains of glucose molecules. The orderly arrangement of cellulose molecules develops crystalline properties of cellulose. These crystalline aggregatesform micelles. Hemicelluluses: These are also polysaccharides Pectic substances: Pectic substances are polymers of uronic acid. ‘Fhey are closely related to hemicellulose molecules. The) hioe three forms: pectin. 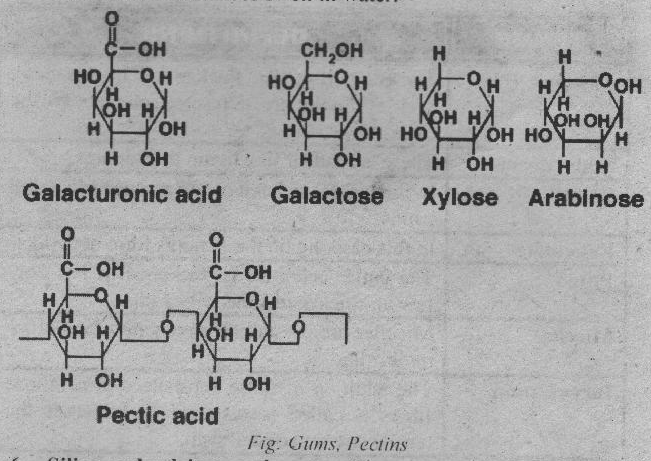 pectic acid and protopectin. Pectic compounds are common in middle lamella and nrimap, these arc coll ddal substance. ‘I he) are highl h)drophilic. Lignification start, in the primary all and middle lamella. It then extends into secondary wall. In some cases like xylem essels. the secondary wall becomes liennied ithorn the lignitication of primal wall. 5. Gums and mucilage: These are also carbohydrates. These are associated with certain types of cells like cells of algae and seed coat. These substances swell in water. 6. Silica and calcium carbonates: These present in the cell wall of epidermis of grasses. 7. Cutin, Suberin and waxes: All these are lipids. These are present in some tissues. Cut in occurs in the epidermal cells. It forms continuous layer of cuticle on the surface of epidermis. The process of deposition of cut in is called cutinization. Suberin is common in the cell wall of cork. The process of deposition of suherin is called suberization. Waxes form a layer on the surthce tissues of some plants. It makes the surface shiny. It is found in many fruits. leaves and stems. 8. Other organic compounds: Some other organic compounds like tannins. resins. fatty substances, oils and certain pigments are also associated ith the cell sall.